Ariel Verlag, 1963. Book. Very Good. Hardcover. Hardback in very good condition with good dust jacket. A couple small edge tears on jacket..
Emanjay; Jacqueline Young Enterprises, 1989. Book. Very Good. Soft cover. Staple-bound paperback in very good to near fine condition..
Grantsville, Maryland, U.S.A.: Hobby House Pr Inc, 1983. Trade paperback in very good plus condition.. Soft cover. Very Good. Ondorisha Publishers, 1976. Hardback in very good condition.. Hardcover. Very Good. 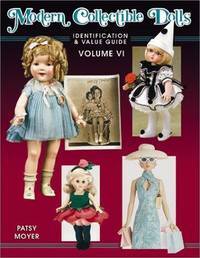 Grantsville, Maryland, U.S.A.: Hobby House Pr Inc, 2001. Trade paperback in fine condition.. Soft cover. Fine. 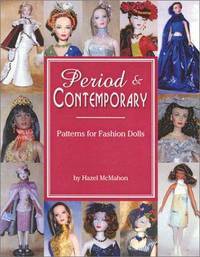 More About Dolls. 1st ed. H. L. Lindquist Publications, 1946. Trade paperback in very good condition with good minus dust jacket. Spine faded and a few small tears on jacket. Stated 1st edition.. 1st Edition. Hardcover. Very Good/Good. 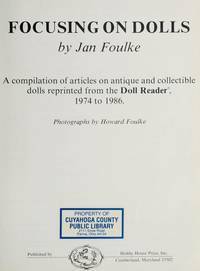 Still More About Dolls. 1st ed. H. L. Lindquist Publications, 1950. Hardback in very good condition with fair plus to good minus dust jacket. Jacket faded and has some tears to back side. Stated 1st edition.. 1st Edition. Hardcover. Very Good/Good. Los Angeles, California, U.S.A.: Hp Books, 1984. Trade paperback in good minus condition. Book has wave to pages.. Soft cover. Good. Paducah, Kentucky, U.S.A.: Collector Books, 1985. Trade paperback in very good minus condition. Previous owner name written on front end page.. Soft cover. Very Good. Warner Books, 1982. Trade paperback in very good condition with 3/4 paper dust jacket sleeve. ISBN listed in book is 044697710x.. Soft cover. Very Good/Very Good. Watson-Guptill, 1967. Hardcover in very good condition with good dust jacket.. Hardcover. Very Good/Good. Radnor, Pennsylvania, U.S.A.: Chilton Book Co, 1980. Hardcover in fair condition. Loose spine. Name embossed on front end page. No dust jacket.. Hardcover. Fair/No Jacket. 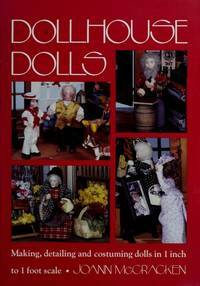 Grantsville, Maryland, U.S.A.: Hobby House Pr Inc, 1985. trade paperback in very good + condition.. Soft cover. Very Good. Waukesha, Wisconsin, U.S.A.: Kalmbach Pub Co, 1995. Trade paperback in fine condition.. Soft cover. Fine. New York, New York, U.S.A.: Bookthrift Co, 1987. Trade paperback in very good condition.. Soft cover. Very Good. Grantsville, Maryland, U.S.A.: Hobby House Pr Inc, 1988. large hardcover in near fine condition with near fine dust jacket. Hardcover. Fine/Fine. 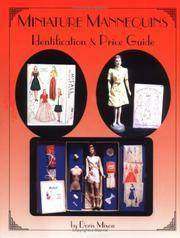 Paducah, Kentucky, U.S.A.: Collector Books, 1986. large paperback in very good condition. name inside, otherwise clean. Soft cover. Very Good. Grantsville, Maryland, U.S.A.: Hobby House Pr Inc, 2001. paperback in near fine condition. Soft cover. Fine. Hale, 1982. hardcover in fine condition with fine dust jacket. Hardcover. Fine/Fine. Paducah, Kentucky, U.S.A.: Collector Books, 1997. LARGE HARDCOVER IN VERY GOOD + CONDITION. Hardcover. Very Good.